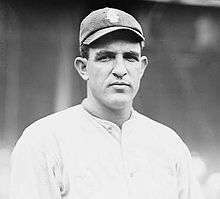 James Leslie "Hippo" Vaughn (April 9, 1888 – May 29, 1966) was an American left-handed pitcher in Major League Baseball for the Chicago Cubs during the 1910s. He had some good years for the Cubs during a time when they were not always competitive, winning over 20 games in five seasons, including a National League-leading 22 in 1918, when the season was ended a month early due to government restrictions brought about by World War I. That same year, Vaughn also led the National League in earned run average (ERA) and strikeouts to become the ninth triple crown winner in the modern era and the fifteenth overall. Vaughn was born in Weatherford, Texas. Aside from the unflattering nickname (at 6-foot-4 and 215 pounds, he was only slightly less heavy than 1970s Cubs star Rick Reuschel), he is best remembered for his participation in what the record books used to refer to as a "double no-hitter". On May 2, 1917, at the ballpark now known as Wrigley Field, Vaughn dueled with Fred Toney of the Cincinnati Reds for nine hitless innings. In the top of the 10th, the Reds scored on a couple of hits after Vaughn had retired the first batter. Larry Kopf singled and later scored on a hit by Jim Thorpe. Toney continued to hold the Cubs hitless in the bottom of the inning, winning the game for the Reds. With changes to the scoring rules in recent years, this game is no longer considered as a no-hitter for Vaughn, but is still the only occasion in major league history nine innings were played without a hit. Vaughn died at age 78 in Chicago, Illinois. Hippo Vaughn was residing in Kenosha, Wisconsin when he was stabbed by his father-in-law at midnight on November 24, 1920, during an argument at the Vaughn home. At the time he was in divorce proceedings with a hearing set in a few days. His wife's father, former Kenoshan Harry DeBolt who now lived in the east, returned to Kenosha to attend the hearing. Newspaper reports at the time said DeBolt was angered over charges made by Vaughn that his wife had been friendly with other men. However, James and Mrs. Vaughn had already effected a reconciliation before the case was to be heard. Their 9-year-old son was with them. As Vaughn was returning to his home he was met on the street by his father-in-law, and an argument followed. DeBolt, according to the police report, slashed at the pitcher with a razor, cutting through his overcoat and inflicting a wound to the stomach. Vaughn was taken to the Kenosha Hospital and was able to leave the facility within a few days. Following the stabbing incident, DeBolt fled the city and was sought by police in several jurisdictions.